Are you struggling with below-average or average click-through rates? Have you been trying hard to improve your ads so that your average click-through rate gets higher? Don’t’ worry! We have got you covered. In this post, I will share some expert tips and tricks that can help you improve your average click-through rate. Your ad title is what viewers will read first and if it is not persuasive enough, they will not click on your ad. Having attention-grabbing, persuasive messaging is one of the key factors that determine your ads’ average click-through rate. If your product can provide a solution to a customer problem, you can ask them a question about it and then provide a clear solution. Anyone who is searching for an answer to their problems will find such an ad useful. In the example below, the advertiser highlights how their product solves the limp hair problem by increasing hair volume. Anyone searching for “volumizing shampoo” would find this ad relevant and is likely to click on it. Clearly stating your product’s price or highlighting any current promotional offers is an effective way of improving your average click-through rate. If you are running any such offers, why wait for customers to visit your website to find that out? Instead, you should highlight those in the ad title or body, to attract more clicks on your ad. For example, in the ads shown below, which one are you more likely to click? If you picked the first one, you’re not alone. The first ad mentions both the price and discount offered and sets the expectations right at the beginning. The second one does not provide any such information. The third one provides some information in the ad copy but viewers might already click on the first ad before they read through the third ad’s body. Telling people your USP makes your ad stand out from other ads, as it tells the viewers why they should pick your product over others. Whether you provide free delivery, a warranty, or anything else that makes you different from competitors, you can showcase that in your ad. Using your primary keyword in your ad, especially in the ad title or the URL of the landing page, shows viewers that your ad is relevant to them. Google Ads provides several ad extensions that you can use to provide viewers with additional information about your business. This extension allows you to add your contact number in the ad. This not only lends more credibility to your business but also makes it easy for potential customers to contact you. See the example below, where the advertiser has added their contact number right at the top of the ad. Adding a location along with directions to your ad makes it easy for local customers to find your physical store locations. This feature is especially helpful for local ad listings and helps drive footfall in stores. Using this extension you can provide more direct links to your website’s other landing pages. For example, if you have an apparel website, you can provide two site links, one for women’s clothing and another for men’s clothing. Viewers find this more relevant as they can click on exactly what they are looking for. In the example below, Levi’s has used this extension to provide direct links to two specific pages on their website. This extension allows you to put a direct link to your mobile app below your ad. This feature is especially helpful to improve the click-through rate for mobile users and to boost app downloads. See how UberEats has provided the “Install” button below their mobile ad to drive more app downloads. You should always add a call-to-action to your PPC ads to prompt ad viewers to take the desired action. If you want them to shop from your website add “buy now” or “shop now.” If you want them to book tickets to an event you can add “book your tickets now.” Similarly, to prompt different actions, you can add different calls-to-action. 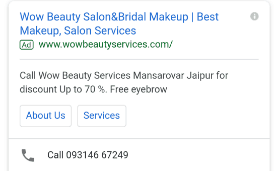 In the example below, the advertiser has used “Get a Quote” as a CTA and has provided a website link and contact number for customers to get a quote. Mobile users constitute a significant share of online traffic and shouldn’t be ignored when running a paid ad campaign. If your ad is not properly optimized for mobile devices, you might lose a significant share of your potential customers. If you are running several versions of the same ad for testing purposes, ensure that at least one is specifically for mobile users. Such ads should include a mobile-specific call-to-action like “call now,” like in the example below. Also, ensure that your website is optimized for mobile devices and that you direct mobile users to mobile-optimized landing pages. Otherwise, you will just drive traffic to your website but won’t be able to get conversions. Now that you know how to get more than just average click-through rates on your ads, the next step is to measure the performance of your various ads. 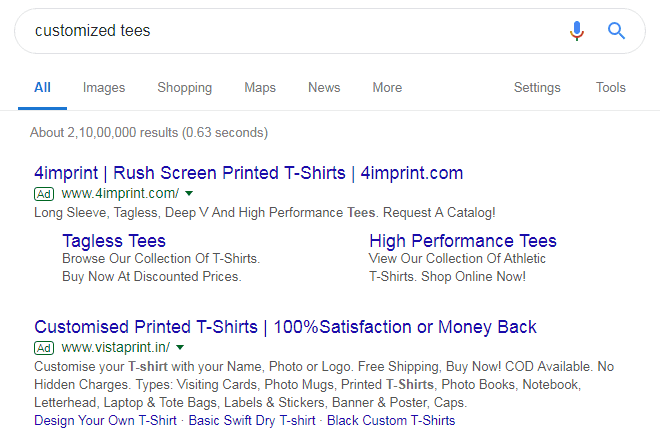 For this purpose, you can use Google Ads’ “Responsive Search Ads” feature. This allows you to create multiple variations of your ad using various combinations of a few titles and ad copy. You can add up to 15 titles and 4 descriptions and Google Ads will try out multiple combinations of these resulting in thousands of unique ads. You can then check the average click-through rate for each unique combinations and determine which types of ads work best. This technique provides an easy way to A/B test your ads and determine which ads get the highest average click-through rates. Use these expert tips to improve the average click-through rate of your ads and get the best out of your ad campaigns. Do you know any more tips or trick to improve the click-through rates of ads? Let us know in the comments below.